The KONG Cat - Wrangler Scratch Mouse is a fun toy mouse for your cat. The toy is made of rope. This allows your cat to sharpen its nails properly. The mouse's tail is made from a soft material that moves whilst playing. The mouse also makes a rattling noise. The smell of the catnip keeps the cat's attention on the toy. The KONG Cat - Wrangler Scratch Mouse is a fun toy mouse for your cat. Because the toy is made of rope, your cat can sharpen its nails on it. The smell of catnip will keep your cat's attention while playing. 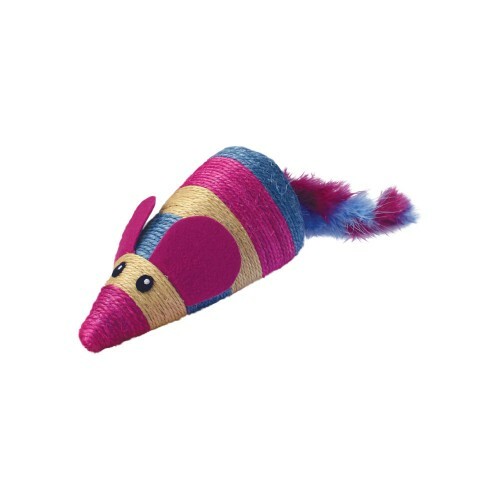 The mouse also makes a rattling sound and its tail moves whilst playing. Have you used KONG Cat - Wrangler Scratch Mouse before? Let us know what you think about this product.